We live in a world of change. The introduction and immediate acceptance of iPod, Tivo, and other “events” alter the way we work and play. What is important is to recognize not the events or products themselves, but the solutions they provided. Shift Happens. Remaining an agile competitor involves rethinking what products are, how they should be made and sold, who buys them, and how much buyers should pay for them. The goal is strategic relationships with customers: stable, long-term relationships that can survive constant marketplace change. The means by which companies can accomplish this is by selling solutions to individual customer’s problems, rather than selling products that the customer then has to fashion into solutions. Providing solutions creates relationships. Often they can survive for long periods of time. These relationships are based on the inevitable dependencies and interactions that arise when producer and customer come to understand one another well enough to create solutions together. 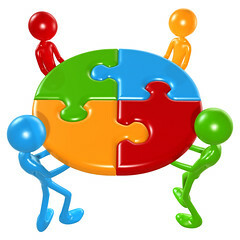 At the same time, the possibility for continuous “solution product” the customer’s problems – is created. The iPod is a perfect example. It is a not solution to the way you play music. It is a solution to the way you purchase music. While Apple most often is credited with attractive product design and the technology of true plug- and-play, the genius of iPod is in the iPod Music Store that sells one song at a time, instead of an entire album. And that single song can be stored, played, and “burned” so that users get to create their own jukebox. Last week Apple announced an iPod that plays video, as well as music. At the same time, Apple announced an alliance with Disney, which owns the ABC and ESPN networks as well as their signature entertainment products, to provide video content. This is ground breaking. Apple and Disney have effectively created a new “pay per view” solution for people on the go that may change the way we view television. What customers have always wanted, but have not been able to buy from mass-market producers, are solutions. They have had to settle for mere products. Ideas like the iPod platforms mean customers do not have to settle. And, as iPod has proved, they will pay for that. Of course, not all of you sell hard goods. Many of you are in the service business. But regardless of what you offer, service and quality – not price – continue to be the strongest competitive advantages. For your organization to survive you must constantly improve the customer’s experience. According to surveys from Stanford University and Carnegie Institute of Technology, only 15 percent of success in business is due to technical knowledge while 85% percent is due to people skills, including sales, support and customer service – all the areas that touch the customer. The business card for one resort’s general manager doubles as a free room offers for select guests. Now that’s really a selling solution. Hyatt requires their management to take the place of bellmen, cooks, maids, and other staff workers for a day of training. This role reversal helps both management and staff what the other levels in the organization deal with each day. The Mill Casino and Hotel in North Bend Oregon reproduced works of art on the back of room keys. The key also mentions that reprints are available for sale in the gift shop. Are you old enough to recall when gas station attendants checked the oil in your car and washed the windshield? Well Win-River Casino wants to make sure that their guests feel at home, so they wash every car’s windshield and leave a note. How about the long lines and the frustrated guests waiting in them. . .for anything? What would happen if you delivered hot chocolate, a piece of candy, a small bag of pretzels, while they waited? Lexus dealers often wash a car and fill the tank with gas after a service visit. While the cost of gas now may prohibit this practice there is no reason that any dealership can’t return the car washed and vacuumed. Each of us can think of what we would like if we were our own customer. Today solutions must be offered in real time. Remember, it can be as simple as using the resources you have, just in different ways. It is often simply transferring resources with the simple objective of stimulating new business and retaining existing customers. Share the dream of your entrepreneurial vision. Bring joy to the workplace. Encourage others to think like owners. Owners should think like customers. Make sure that you remain in contact with your customers, employees, and suppliers. Say you’re sorry, and mean it. Say thank you, and believe it. Opportunities are there for all of us if we simply look for them.